“Green” gardening and wildlife habitats go hand in hand. Some people learn the pleasures of sharing their gardens with wildlife after they have begun to create a more eco-friendly landscape and the birds, butterflies and other critters just start showing up in the native plants and chemical free, critter safe zone. Other gardeners make a concerted effort to create habitat for wildlife, which by its nature and definition, results in a more environmentally friendly landscape. Since May has been designated as Garden for Wildlife Month, now is the perfect time to learn how to make your own landscape more wildlife friendly. You can learn more about creating wildlife friendly landscapes by visiting some of the links at the bottom of this post. Thanks Donna. 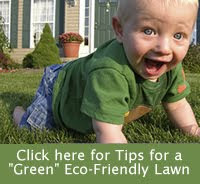 I really appreciate it when our readers share what they have learned to do around their own eco-friendly gardens. Great article! I loved reading about the hornworms because as I was reading along, my first thought was the same- "Those grow into awesome sphinx moths!" I'm going to go buy a couple extra tomato plants for those guys, just in case they show up. Thanks for the suggestion! Birds also feed upon tomato hornworms. I once watched Indigo Buntings go back and forth from their nest on the front side of my house to my garden out back where they gathered small tomato hornworms to feed to their chicks. If your landscape is suitable for birds to nest, they will take many, but not all, of the caterpillars in the yard. This helps to prevent overpopulations of the insects; otherwise the insects might eat themselves out of house and home!